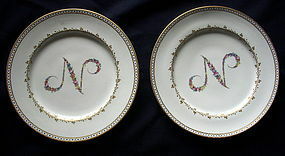 Pair of late 18th century Doccia porcelain plates. 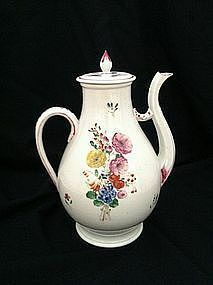 A large Doccia porcelain coffee pot c.1800 with enamel floral decoration. A Doccia master salt circa 1770; the molded form is a copy of a silver form. 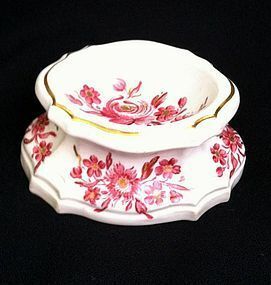 The piece is decorated with red enamel flowers with gilt highlights. Doccia was founded circa 1735 near Florence and continues to produce porcelain. Height is approximately 1 ½ inches (3.8 cm). Length is 3 ¼ inches (7.6cm) and width is 2 5/8 inches (5.1 cm). Condition: Chipped foot with slight discoloration on foot, otherwise nice.